Prototype: German Railroad, Inc./Railion (DB AG) class 152 fast general-purpose locomotive. 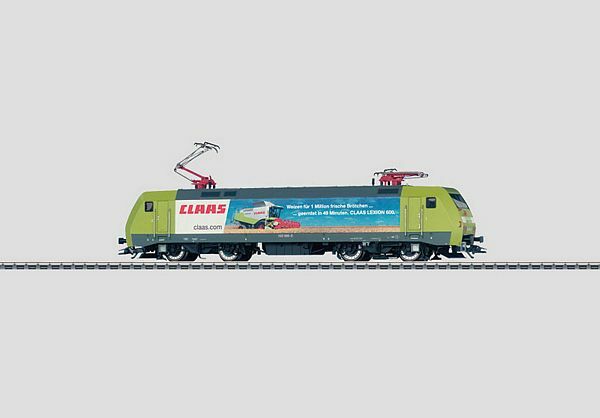 Advertising design (combine harvester theme) for the firm CLAAS KGaA mbH in Harsewinkel near Osnabrück, Germany. Model: The locomotive has an mfx digital decoder, Softdrive Sine high-efficiency propulsion, and a sound effects generator. It also has a maintenance-free, compact design motor. 2 axles powered. Traction tires. The headlights are maintenance-free, warm white LEDs and the marker lights are red LEDs. The headlights and marker lights will work in conventional operation and can be controlled digitally. The engineer's cabs have interior details. The locomotive has separately applied metal grab irons. Length over the buffers 22.5 cm / 8-7/8. Lighting with white and red LEDs.